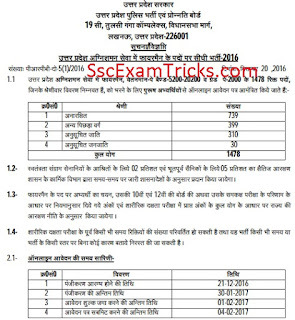 UP Police Jail Warder Admit Card 2017 – UP Police Fireman Hall Ticket 2017 - www.prpb.gov.in. 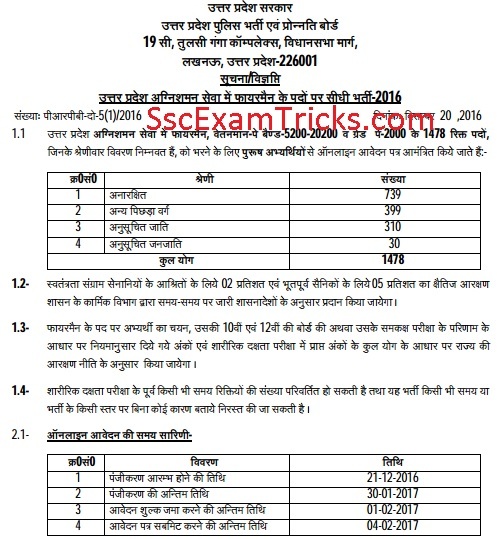 UP Police department has all set to organize written test for 3789 vacancies of Jail Warder and Fireman which is expected to be organized in March/ April 2017 at many exam centres across the state. The successfully registered candidates can download their UP Police Jail Warder Fireman Admit card 2017 in the month of March 2017 (About 15 days before the exam date) from official website www.prpb.gov.in. Huge numbers of candidates are ready to appear in the examination. Those candidates who are planning to attend written exam; they can download their UP Police Jail Warder Fireman Admit Card 2017 from direct link given in the end of the page. The physical measurement will be made on the basis of standards mentioned in the notification. In the PMT, Height and chest (with or without expansion) will be measured by the authority persons. The qualified candidates will be invited to attend medical test which will be held along with document verification. The final merit list will be prepared on the basis of written test. UP Police PET Admit Card 2017: To be available 10-12 days before the PET. 1. Go to the official website www.prpb.gov.in. 2. Go to the ‘Important News and Alerts’ section where you will find new link to be activated as ‘UP Police Jail Warder Fireman Admit Card 2017’. 3. Enter your registration details such as registration number, date of birth and verification code given in the image. 4. Finally, click on the ‘Download Admit Card’ button.